Just to emphasize: the User Library version of Euro Reakt (https://www.native-instruments.com/en/r ... show/9093/) will remain free, so there's no pressure to buy the new version if you are happy with the old workflow. - Rack files use significantly less storage space. A typical Blocks Ensemble for me is around 80+ MB. A Rack is a few kilobytes. This means that I'm experimenting and saving many more Racks. The Euro Reakt package comes with 100 example Racks, each with NKS tags and mapping. - Graphics have been improved, a lot of which is thanks to Jonathan on the Reaktor team. - Tooltips have been implemented on every port and knob. A lot of them were missing. This is definitely in response to VCV Rack. The paid ToyBox and UA Blocks are really for the free Reaktor Blocks/Base crowd. Apparently it won’t affect the User Library Blocks (the EuroReakt Blocks are still free, for example). However, all the User Library stuff only works in the full Reaktor patching window. They basically made a free version with front patch cables, which is a really neat idea when you think about it but, I think all the existing blocks users from way back really would have liked to see the functionality extended to them as well. SUre , but you can't expect N.I. to alter every existing user library block . If every U.L. creator would update his block , we can use them instantly .with the new patch system (ensemble mode ). Is there a way to make polyphonic patches easily with the new racks/front panel patching? Only how you would do it on a real hardware modular, by multiplying modules and lotsa wires. Thats a bummer. If NI just added some kind of container for 1 voice, they could easily allow polyphonic instruments. Basically you put all your modules in that box and Reactor virtually creates one for each note. This would obviously be to accomodate people who doesnt want to delve under the hood to wire it up for polyphony. This is actually how instruments (.ism) in Reaktor do work, but due to how Blocks framework is implemented, polyphony managed at .ism level was not possible. Yeah that’s a good point. You can patch one of Reaktor’s polyphonic instruments into the Blocks framework, can’t you? Here I created an effect , it splits the incoming signal in 1024 bands , just like a vocoder (with 1024 bands . I know it can do polyphony, I was refering specifically to the blocks/rack. 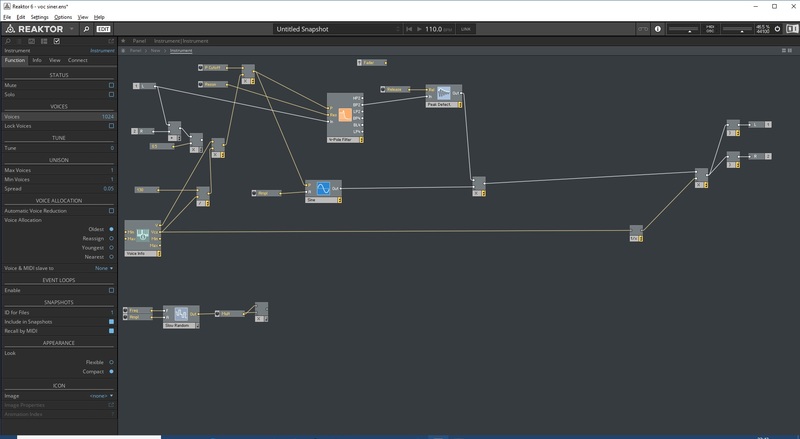 It is technically possible (with a bit of fiddling) to have polyphonic connections between blocks (there are some discussions on the NI form of ways to do this)..
Definitely my favorite Rack in the bundle.